The title of this blog may insinuate that there is actually some auto maintenance that can be skipped, so let's be clear, there isn't! The purpose of this article is to remind drivers that there are some services that may fall by the wayside, but they need to be conducted on time, as called for your the vehicle's service manual. Putting off or neglecting your vehicle of important maintenance will result in massive troubles for the brakes, engine, transmission and other systems in your vehicle. Never, ever put off factory scheduled auto maintenance! The oil change is a service that is designed to help keep the engine running smooth. When an oil change is completed the old oil is drained from the vehicle, bringing dirt, debris and other contaminants from inside the engine with it. This helps restore power and fuel efficiency while ensuring there is proper lubrication under the hood. Your car uses a number of specialized fluids to operate its various systems. Over time these fluids break down and/or collect contaminants. To ensure these contaminants or old fluids don't harm the systems they operate in, such as the cooling system, power steering system or differential, it is important that fluid flushes are completed. Transmission service consists of draining the transmission of fluid, removing and cleaning the transmission pan and replacing or cleaning the transmission filter, if applicable. The pan will then be reinstalled with a new gasket and fresh fluid added. If transmission service is put off it could result in rough gear shifts and ultimately the failure of the transmission. Cars that utilize a timing belt need to have it replaced on time, so check your owner's manual to see when that is for your vehicle. Not replacing this part can cause the engine's moving parts to be thrown out of sync, resulting in massive damage that could require a rebuild or replacement. Even if you aren't experiencing braking trouble it is smart to have your brakes checked every 10,000 to 20,000 miles. Worn brake pads can hinder braking ability, resulting in excessive stopping distances. Always be sure to keep up with scheduled auto maintenance to ensure your car is safe and reliable. 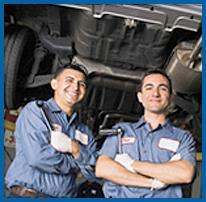 For professional auto maintenance in Covina head to Hye Tech Auto. We are a dealership alternative for all services! To schedule an appointment for expert auto maintenance in Covina give us a call at (626) 332-5452 today.